Many people believe that Kazakhstan is a country full of indefinite flatness. And, in some ways, there is a lot of flatness to be seen here. However, Kazakhstan also boasts bustling cities, amazing mountains, sparkling alpine lakes, and stunning canyons. In just one week in this vast country, I saw all of the above (and more!). Some Americans claim that Kazakhstan is an inaccessible destination because of where it’s located. However, it’s not that much farther from the USA than Thailand or South Africa, both of which see thousands of American tourists each year. In fact, in just one week, you can experience a lot of the best things this country has to offer! Read on to hear our tried-and-tested 7-day itinerary if you only have one week in Kazakhstan. If you’re flying into Almaty, you’ll arrive into Almaty International Airport (ALA). From there, a taxi to the city center costs up to ~3,000 KZT and takes about 30-45 minutes. In Almaty, I’ve heard great things about European Backpackers Hostel (budget) or Renion Park Hotel (mid-range), which are both centrally located and reasonably priced. As one of the largest cities in Central Asia, Almaty feels like the “New York” of Kazakhstan. With crowded streets, upscale shopping malls, and a widespread public transit system, Almaty is easy to get around and explore. While you’re recovering from jet lag, you can get to know some of the areas that make Almaty such a beloved city in Central Asia. You can roam the city independently, or register for one of the well-renowned walking tours from Walking Almaty. One of the city’s most notable sights, the Ascension Cathedral is a colorful Russian-style church located in one of the city’s most picturesque parks (*Note: As of August 2018, the Ascension Cathedral is closed and covered in scaffolding for renovations). Even if you don’t enter the cathedral, the surrounding Panfilov Park is the perfect place for a morning stroll or some light people-watching. There are many museums in the area, like the Kazakhstan Museum of Musical Instruments or the Central State Museum. In the late afternoon or early evening, head to Kok-Tobe by cable car for sweeping views of the city and some prime people-watching activities. Or, alternatively, stroll along the Zhibek Zholy walking street and grab your dinner there. I didn’t actually make it up to Medeu and Shymbulak when I was in Almaty, but I heard from many fellow travelers that this was one of the best things to do while visiting Almaty. Medeu is the city’s outdoor ice skating rink, and Shymbulak is the nearby ski resort. In the winter, they serve these exact purposes, but in summertime, the grounds open up for a variety of walks and day hikes.Many people told me it was akin to hiking in the Alps (which is a pretty raving review coming from Swiss people themselves). So, if you feel like getting outdoors, I’d recommend taking a day of your week-long itinerary to go up to Medeu to do some hiking. To get to Medeu, you can take the Medeu cable car or travel by public bus/taxi. One of the most beloved local hangouts in the Almaty region is Big Almaty Lake. Known to locals simply as ‘Bao,’ this water reservoir is located high in a mountainous area. Depending on the time of year and the lighting, the water ranges from a pale blue to a deep turquoise. It’s the perfect place to enjoy a picnic by the lakeside and people watch. However, don’t go near this precious drinking water – it’s guarded by soldiers and is illegal to enter. To get to Big Almaty Lake, you can hire a taxi from the city each way for ~3,000-4,000 KZT each way. Yandex Taxi is an app that works really well for ordering taxis over a WiFi or cellular connection. I STRONGLY recommend organizing your transport to and from the lake in advance, as taxis can be somewhat hard to come by up at the lake. If you have trouble communicating with your driver, you can also ask your hotel/hostel to organize it for you (usually at a slightly more expensive price). Charyn Canyon is a huge surprise in the middle of otherwise steppe-like terrain. It’s a large, jutting canyon that’s a beautiful shade of red-orange. Inside the canyon, there are amazing and somewhat extraterrestrial-looking rock formations. It’s really spectacular, especially if you can manage to go when the sun is low in the sky. Inside of the canyon, there’s a hiking trail that takes you to a small river and campground, but you can also hike the rim, which gives you amazing bird’s eye views of the canyon below. Take a day tour from Almaty – According to other travelers, you can find a day trip to Charyn Canyon from Almaty for a very reasonable price. However, you’ll be really time-constrained and the tours don’t actually run regularly. Inquire with your hostel or hotel for more information. Join a multi-day tour which includes Charyn Canyon – This is the option I did, and the one I recommend for people who are both budget-conscious and time-constrained. However, see below for more information on the tour I booked and why I’d recommend finding a different one. I paid ~$300 USD for a 4-day trip, including all meals and accommodation. Tours generally cost less per person with more passengers. Hire a private driver – This is the most expensive option, but is also the safest, most flexible, and most convenient. Rent a car and self-drive – Iron Horse Nomads and European Backpackers Hostel. As a side note, I took a 4-day tour to Charyn Canyon, Kolsai Lakes, Kaindy Lake, and Altyn Emel Sand Dune. I highly recommend doing the tour if you’re short on time, so you can see everything in one fell swoop. However, during my tour, our group had some run ins with terrible disorganization and our driver once come to pick us up while drunk. Therefore, I can’t recommend – and actively dissuade you from attending – the tour I went on (with Almaty Backpackers). To find an available tour, you can inquire at one of the local tour agencies or with your hotel to try and find a complete tour to join. Kaindy Lake was my favorite place in all of Kazakhstan, and it should be pretty easy to see why. It’s one of the most brightly-colored and strange lakes I’ve ever seen, with an outcropping of white tree trunks sticking out of its otherwise glass-like waters. These trees used to stand in the valley before it was a lake, and remained there after the waters and glacial melt started to enter the region. To do this, you’ll need to take a bus, taxi, or private car to Saty village. There’s a rumor about a bus at 9 am from Almaty to Saty, but I was never able to confirm this. I came to Saty as part of my tour. From Saty, you need to take another marskrutka (4WD) to Kaindy Lake. From the parking lot, you can walk around the lake, to the front viewpoint (pictured above) or the back side, where swimming is permitted. After your adventure at Kaindy, you’ll need to spend the night in the area. You have two options for accommodation here: camping at Kaindy Lake (a prime spot by the lakeside) or staying in a yurt/guesthouse in Saty village. For avid hikers, Kolsai Lakes is where you want to be. Filled with 3 magnificent glacial lakes surrounded by mountains and endless miles of emerald evergreen forests, Kolsai is the perfect place to spend a day (or two) hiking. You can also go for a swim in the second lake, but keep in mind that it’s VERY cold. Here, there are dozens of miles of trails you can take to 3 different glacial lakes within this national park. I did a day hike to the second lake, which was ~17 km round trip. To get here, you can drive (4WD) or take a marshrutka from Saty village. Upon arrival, there’s a small fee to enter the park. You’ll spend another night in Saty. 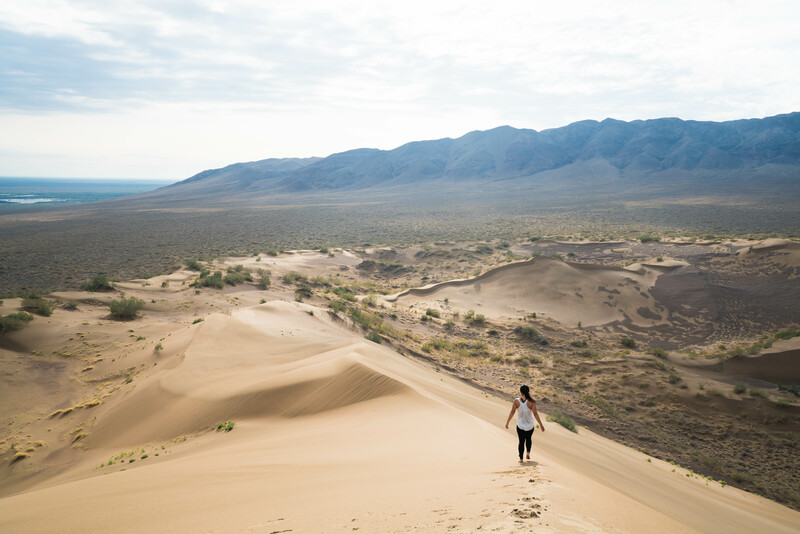 The next day is a driving day – you’ll be headed to the giant sand dunes of the Almaty area in Altyn-Emel National Park. Start early because the drive is really long – likely 4-5 hours or more. However, once you get to Altyn-Emel, you won’t be disappointed. It’s not a huge complex of sand dunes, but the unique thing about it is that it’s surrounded by flat steppe. You drive for miles on the flattest, most open road ever, and BOOM, you suddenly see a giant golden sand dune pop up out of nowhere. It’s called the “singing sand dune” because the winds cause a low, rumbling hum if the conditions are perfect. After you’ve hiked up and around the sand dunes, you can head back to Almaty and spend the night there at European Backpackers or Renion Park Hotel. On your last day, you’ll head to the airport for departure. One week in Kazakhstan flies by, doesn’t it? One week in Kazakhstan is definitely enough to get a feel for the culture and nature of the country, but if you can take an extra week here, I’d highly recommend it. If you have an additional week in Kazakhstan, here are a couple more places you can explore. If you’ve got a few more days, Shymkent and Turkestan are the easiest places to visit from Almaty. In Shymkent, you can experience the most hospitable people in all of Kazakhstan (true story), and use it as a jumping off point to experience the Aksu Canyon, Aksu-Zhabagly Nature Reserve, and the Tian Shan Mountains. Turkestan is famous for its Silk Road-style mausoleum, adorned with gorgeous tiles and magnificent architecture. To get to Shymkent/Turkestan, you can hop on an overnight train, a marshrutka, or a flight to get to Shymkent from Almaty. Then, Turkestan is just a few hours on a minibus from the main bus station. For budget travelers, I recommend Hostel Sweet Home in Shymkent. Albina, the owner, is one of the kindest and most hospitable people I met in Kazakhstan, and she makes a delicious breakfast, too. The hostel is affordable and clean, and there’s air conditioning in all of the bedrooms. Astana is Kazakhstan’s capital, and it’s unlike any other city I’ve ever seen. With shiny, modern, almost outer-space-like architecture and some of the most amazing mosques and museums in the country, it’s definitely worth a visit if you’re craving a city vibe. There are a surprising number of things to do in Astana considering it’s pretty far off the typical tourist track. From Astana, you can also take an overnight trip out to Burabay National Park, a beautiful, lake-filled park at the very northern part of Kazakhstan. For budget travelers, I recommend Hostel Forum. It is clean, cozy, and private, the staff speaks English fairly well, and it’s very affordable. It’s also easily accessible by taxi or public transportation from many of the main sites. While there’s no direct flight from the USA to Kazakhstan (yet), Kazakhstan is fairly easily accessible with just one layover from most major airports. It’s also easy to find direct flights from large European cities. The major international airports of Kazakhstan are in Almaty (ALA) and Astana (TSE). This is by far the easiest and quickest way to get around Kazakhstan, but it’s also the most expensive. Compared to domestic flights in the United States or Canada, however, inter-city flights in Kazakhstan are reasonably affordable. Local airlines Bek Air and Air Astana offer domestic flights within Kazakhstan. Between Astana, Almaty, and Shymkent there are slow trains that run regularly. However, they are really slow. Like 20+ hours slow. It’s much, much more time efficient to take a plane or even a bus. If you really want to experience trains in Kazakhstan, I recommend taking one between Shymkent and Almaty (or vice versa), as that ride only takes 11-12 hours. You can choose from first class (2-berth), second class (4-berth), and the platzkart (open berth car). Obviously the platzkart is the cheapest, but you can choose your service class depending on your desired level of comfort. You can look at schedules and book train tickets on tickets.kz. You can also purchase tickets in person at any train station.